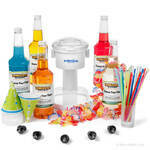 The S900A Shaved Ice Machine is one of HawaiianShavedIce.com�s most popular machines, and it�s included in our convenient Ultimate Shaved Ice Package. 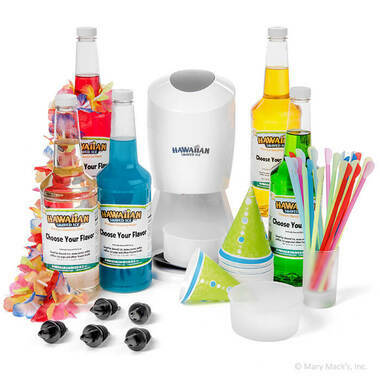 When you buy in bulk, you�ll save money on this high-quality shaved ice machine, and you�ll also receive all of the flavor syrups, cups, spoon straws and other serving supplies necessary for throwing a real party. 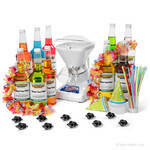 Your guests and your family members will all love the delicious, refreshing treats you�ll serve with your Ultimate Shaved Ice Package from HawaiianShavedIce.com. 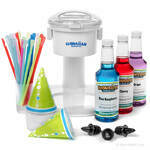 This package includes the S900A Shaved Ice Machine, which makes finer, fluffier shaved ice than that of a snow cone. 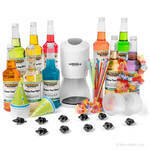 The kit also includes two ice molds to create the round ice blocks necessary for the machine. 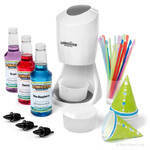 For professional-looking shaved ice presentation, you�ll receive 25 spoon straws, 25 snow cone cups, 5 bottle pourers, and 5 quart-size bottles of premium syrups in your choice of flavors. The Ultimate Shaved Ice Package is a fun way to make dessert for the family or a summer afternoon treat, and it is also one of the top holiday shaved ice gifts. 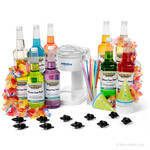 Click here to see the differences between the S900A Hawaiian Shaved Ice Machine and the S700 Hawaiian Snow Cone Machine.